Do you want to add default settings to your WordPress galleries? When you use a lot of image galleries, you can save a ton of time by creating some default settings. In this article, we will share how to setup default WordPress gallery settings to save time. By default, WordPress image galleries don’t have the feature to setup default settings. Since many of you requested it, we added this feature to Envira Gallery. Once the plugin is activated, you are ready to setup the default WordPress gallery settings. You’ll need Envira’s Defaults Addon to add the default settings for your WordPress image gallery. 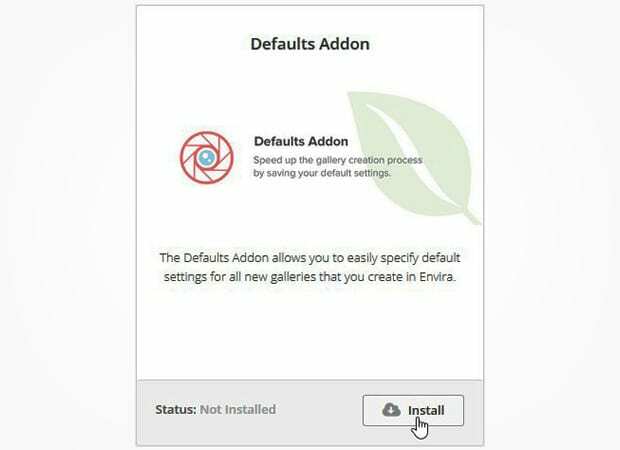 Simply go to Envira Gallery » Addons from your WordPress backend to install and activate the Defaults Addon. Next, go ahead to Envira Gallery. You will see the Envira Default Settings gallery in the list of your image galleries. You should click on the edit option. This Default Settings gallery is similar to a typical Envira gallery. You should go to Config settings and adjust your default settings. Now, all of the new image galleries you create will use these settings. However, you can always customize each individua image gallery with custom code in the shortcodes and template tags. You can check out more details about the settings of an image gallery with Envira here. We hope this article has helped you to learn how to setup default WordPress gallery settings to save your valuable time. You may also want to check out our guide on how to set a default featured image in WordPress.